Well, I have finally made it, more or less, (there is a four mile stretch I have to go back to) to Plymouth, with the help of my friend Vicki, who came down from Taunton to join me for the last lap. Whether my feet have finally acclimatised themselves or whether it was the copious application of alcohol with Vicki last night, but I had no aches or pains at all in feet or legs last night or this morning so set out very jauntily. Around four miles beyond Bigbury-on-Sea is the River Erme. The only way across this is to ford it, which is apparently easily done knee deep within an hour either side of low tide. Unfortunately, I could not discover the times of low tides. 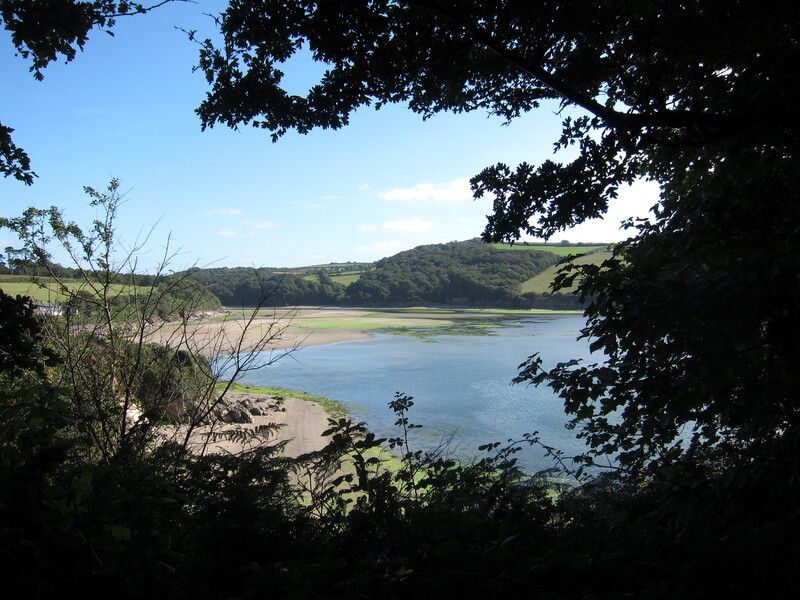 The South West Coast Path site is not that helpful and the best guess I could make, based on nearby rivers, was low tide at 5am and 5pm – not very helpful on this occasion. I couldn’t see us doing a 2 hour walk before 6am! We decided that the sensible thing to do was to drive to the other side of the Erme and leave the it there. I will come back and do this piece though, as it is very pretty and an important part of the walk. I don’t care about the 3 miles I did on the bus to avoid the road at Paignton. We drove down some extremely narrow lanes to reach a little car park on a private estate, only open to the hot polloi on Saturdays, Sundays and Wednesdays. We could see the mediaeval tower tucked amongst the trees and concluded that in days of old the squire was a magistrate during the day and a smuggler at night. Setting out from the west bank of the Erme, we climbed up onto the headland and had marvellous views back to Burgh Island and its unbelievably swanky hotel. 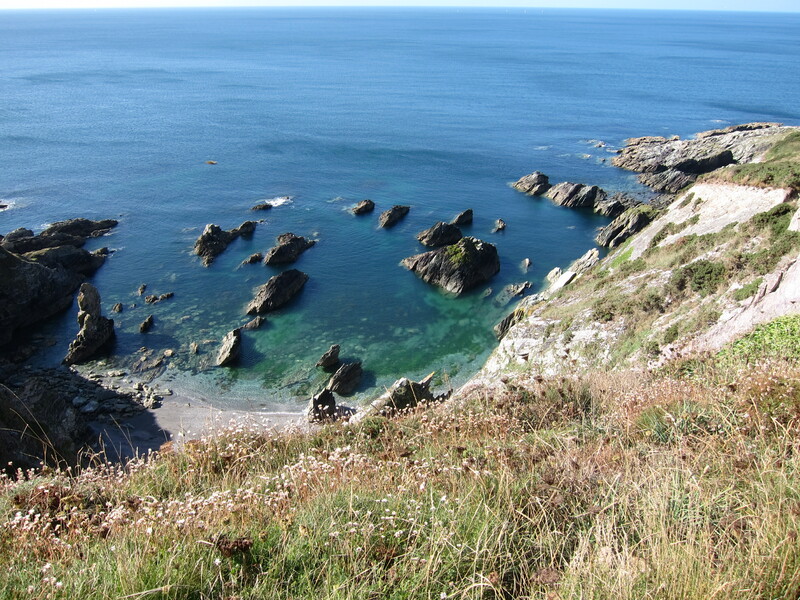 The day was largely spent on top of the cliffs, with a few ups and downs into tiny coves, ideal for bathing or more nefarious activities. There were lots of pleasure boats, yachts and dive boats bobbing on the lightly moving water. The weather was truly glorious. At times we could see the Eddystone Lighthouse – fourth of its name, built to protect mariners from the treacherous Eddystone reef, 12 miles out. We saw huge numbers of butterflies, pained ladies, lots of whites, meadow browns and yellow ones. We also saw some rather pretty lavender crane’s-bill and possibly another kestrel. The earth here has changed again, much less red than further east in Devon, and the stone appears to be slatey. The next obstacle on the route is crossing the River Yealm at Noss Mayo, but fortunately at this time of year the ferry service is constant. We dropped the board to call the ferry and sat on the quay for ten minutes watching as he approached. 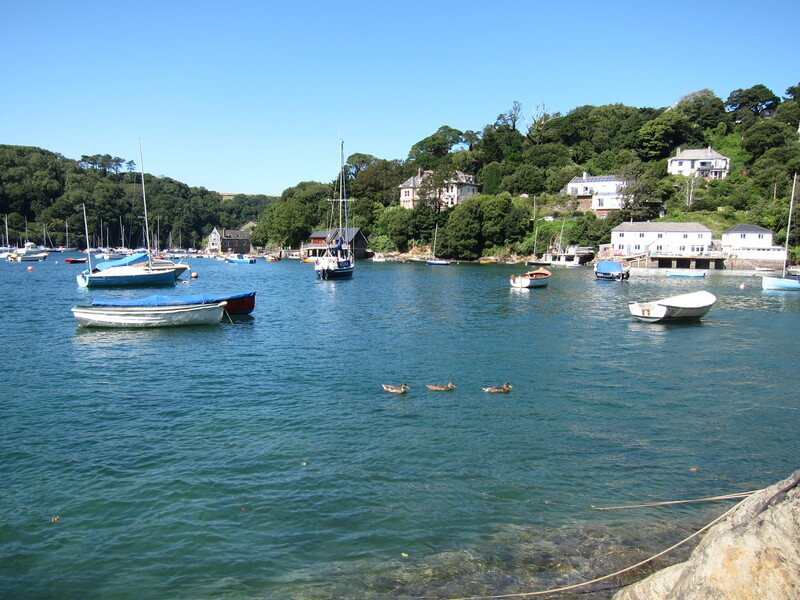 Noss Mayo is a little gem of a place with a perfect location for boats to moor away from the sea. At the mouth is the rock known as Great Mew, guarding not only the Yealm but also the entrance to Plymouth Sound. How brave Drake and those early sailors were, setting out with very limited navigational tools into the unknown for years at a time. 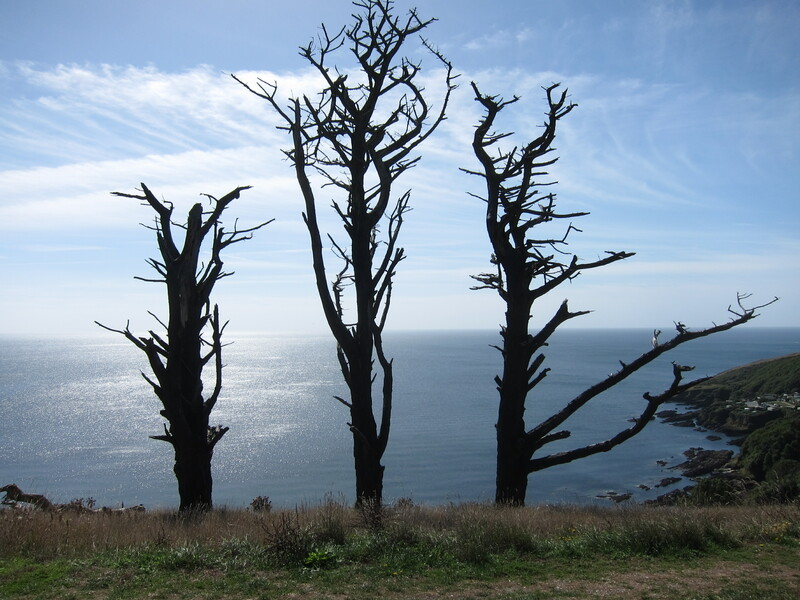 We had planned to stop at Wembury Point for cream tea (me) and a pint of the local brew (Vicki) but it was heaving with people and didn’t look very appealing so we pressed on, passing round Holmbury Bay and being greeted with the fine sight of Plymouth. 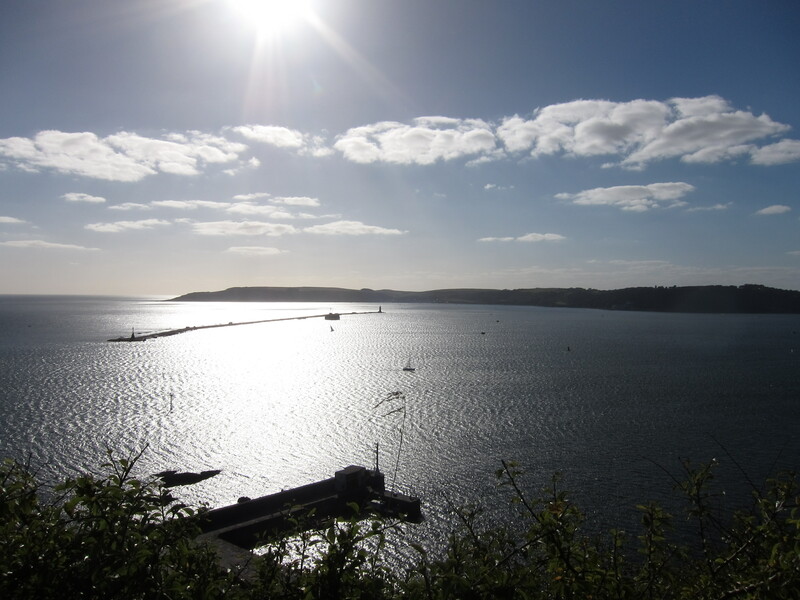 The last few miles seemed quite hard going – maybe the adrenaline had left me, but I struggled to finish the final couple of miles into Mount Batten. We did just over 16 – I have no idea how I managed 23.5 on Monday! However we made it and it was definitely one of the best days I’ve done. I am absolutely delighted to have accomplished so much this week. I have walked 144 miles, and burned nearly 12,000 calories (I have probably consumed at least double that amount in English breakfasts and cream teas). I have walked through geological time – Triassic, Jurassic and Cretaceous; seen a wide variety of plants, butterflies and birds, and even a seal basking on a rock. I shall say goodbye to the south west for now, and begin walking up the east coast over the winter. Next Easter I shall leave England proper and walk into Cornwall.